Bringing a smaller, handheld form factor to Sony's line of digital cinema cameras, the PXW-FS5 XDCAM Super 35 Camera System captures UHD 4K video using a Super 35mm-sized sensor for cinematic imagery. Though small in size, it incorporates professional features that differentiate it from consumer and DSLR/mirrorless cameras and make it suitable for use on productions as diverse as cinéma vérité-style documentaries, reality TV, and commercial and corporate applications. The camera's E-mount will accept most 35mm lenses with the use of adapters, including EF, PL, Leica, and Nikon lenses. 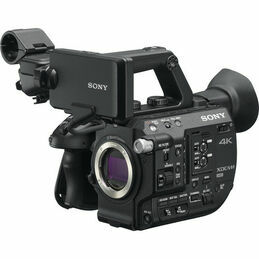 The FS5 incorporates two SD media card slots that support simultaneous or relay recording, and outputs include both HDMI and SDI and Sony's proprietary Multi-Terminal. The body also incorporates an Ethernet connector, headphone jack, and XLR audio inputs. The camera supports Wi-Fi and NFC functionality, allowing you live stream from the camera, or control it from a wireless device.